The AEM intercooler kit is a comprehensive bolt-on air cooling system for your Hyundai Genesis 2.0 Turbo. It contains all of the necessary hardware required for installation. The large bar & plate AEM intercooler core replaces the smaller and less efficient factory intercooler. The new AEM intercooler core is capped on both ends with end tanks that are fully optimized to distribute airflow evenly across the core. 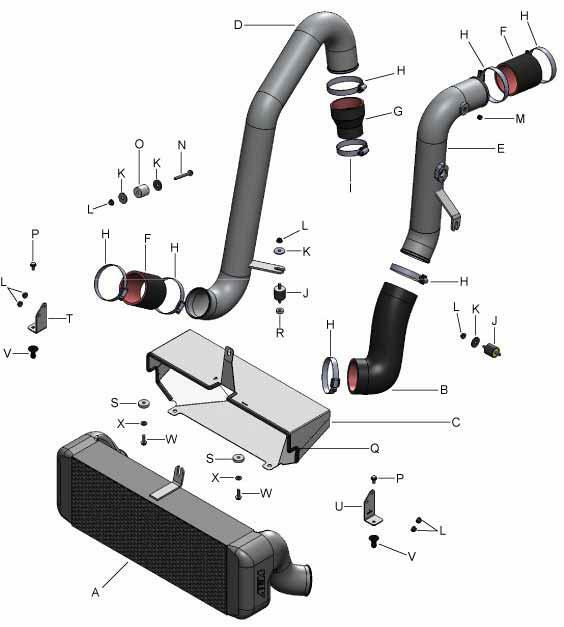 The AEM Intercooler kit also includes high flow intercooler charge pipes, making for a complete system. The end result? More horsepower and torque for your Hyundai Genesis 2.0 Turbo. In addition, you won't have to worry about this intercooler being able to handle high amounts of boost like the smaller and less efficient factory intercooler. The part number for this item is 26-2100c and it fits 2010-2011 hyundai genesis 2.0 turbo models. you must be using an aftermarket air intake system in order to use this aem intercooler kit. We Guarantee the lowest out the door price on AEM Intakes. If you find the same AEM Intake part number for sale somewhere else for a lower out the door price, we will match or beat the price. Keep in mind that our shipping is free when comparing prices and we keep an extensive stock. Most items ship the same business day! Simply give us a call at 866-639-5385 during regular business hours and direct us to where we can see the better AEM Intake intercooler price. We think our prices on our AEM Intakes and intercolers are very competitive, but if you think you've found a better deal, we want to know!